First, let's talk about the fish. 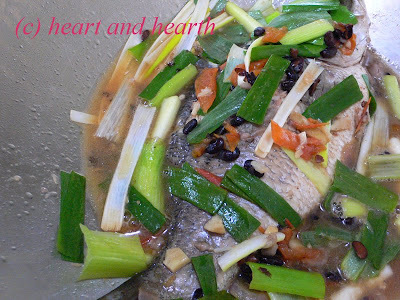 Locally, it is called Apahap or Seabass. It is a freshwater fish gaining much popularity nowadays. It is mostly available in half-kilo sizes per fish, if not smaller. It has a tender, melt in the mouth texture. It is so yummy and fragrant grilled. It can be steamed with simple ginger and soy dressing. This time however, I decided to cook it with Black Bean Sauce (Tausi) just like how my father-in-law used to cook it. Everybody knows about the wonderful pairing of black beans with garlic. But, my father-in-law's secret? The wonderful pairing of fermented black beans and fresh tomatoes. When we talk about black beans in Asia, this refers to the fermented or salted black beans. We are not referring to the fresh or dried black beans that you add into soups, chilies and burritoes. The black beans we are talking about here are small, black soybeans that have been preserved in salt. Also known as Chinese black beans or salty or salted black beans, they have a very strong, salty flavor. Many people say that the black beans have to be soaked for a half hour or so in fresh water before being added to a dish. But I never did this when I cook any dish using the fermented black beans. I usually add it straight from the bottle, and sometimes, during cooking, I even mash some beans to release more flavor. Fermented black beans are quite versatile. Once I ran out of soy sauce, I used some black beans to flavor a stir fry dish. It is not the same thing as the black bean sauce, or the black bean paste, although you can use either one as a substitute for the other, too. 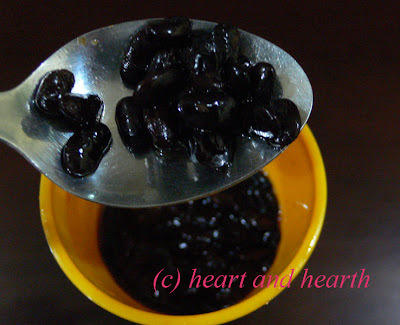 Fermented black beans (tausi) is widely available here in Manila. In your country, maybe you can look for it in Asian Markets and groceries. 1. Heat up the cooking oil in the wok or a skillet. Add in the ginger and stir fry until fragrant and golden brown. Add in the garlic. Saute until fragrant but not burnt. 2. Add in the tomatoes and the black beans. Saute for 2 -3 minutes until juices come out and flavors are melded together. 3. Add in the fish. Cover for a few minutes. Turn the fish to the other side. Add some water if needed, or if you want more sauce. Cook the fish covered until cooked. Around 10 to 15 minutes. 4. Add soy sauce if preferred. Add in the leeks. 5. Drizzle with some amount of sesame oil just before turning off the fire. Serve immediately. This dish and the featured fermented black beans is my entry to Weekend Herb Blogging, a world-wide food event celebrating the herbs and unique plant ingredients and the dishes we make using these ingredients. Weekend Herb Blogging is launched by Kalyn of Kalyn's Kitchen. This week's host is Kelly from Sounding my Barbaric Gulp. To see last week's delicious round-ups, please check out Archana of Archana's Kitchen. Delish! Tausi and tomatoes are so good together! It sounds like a very good combination. There is a type of sea bass here that you find mostly in restaurants, and I'm very fond of it. I need to get some of those black beans; I don't think I've ever cooked with them.